Yesterday, the Financial CHOICE Act of 2017 passed the House of Representatives along party lines, with 233 Republicans and no Democrats voting in favor of the bill, and 185 Democrats and one Republican voting against it. In the event it were to also pass the Senate and become law, the CHOICE Act would do profound, broad-based damage to the future financial security of America’s working families. Among the many damaging things the bill does is to repeal of the Conflict of Interest rule, aka the “fiduciary” rule. The fiduciary rule is the regulation that requires that financial professionals advising retirement savers act in the best interest of their clients—like doctors and lawyers are already required to do. The rule prohibits financial advisers from doing things like steering clients into investments that provide the adviser a higher commission but provide the client a lower rate of return. This rule is sorely needed—conservative estimates put the cost to retirement savers of “conflicted” advice at $17 billion a year. It is noteworthy that today is the day that the fiduciary rule was implemented. This is a huge win for retirement savers, though this big step forward comes with a couple of glaring catches. Representatives who voted for the CHOICE Act have chosen to side with unscrupulous actors in the financial industry, who have profited handsomely from loopholes that allowed them to fleece retirement savers. 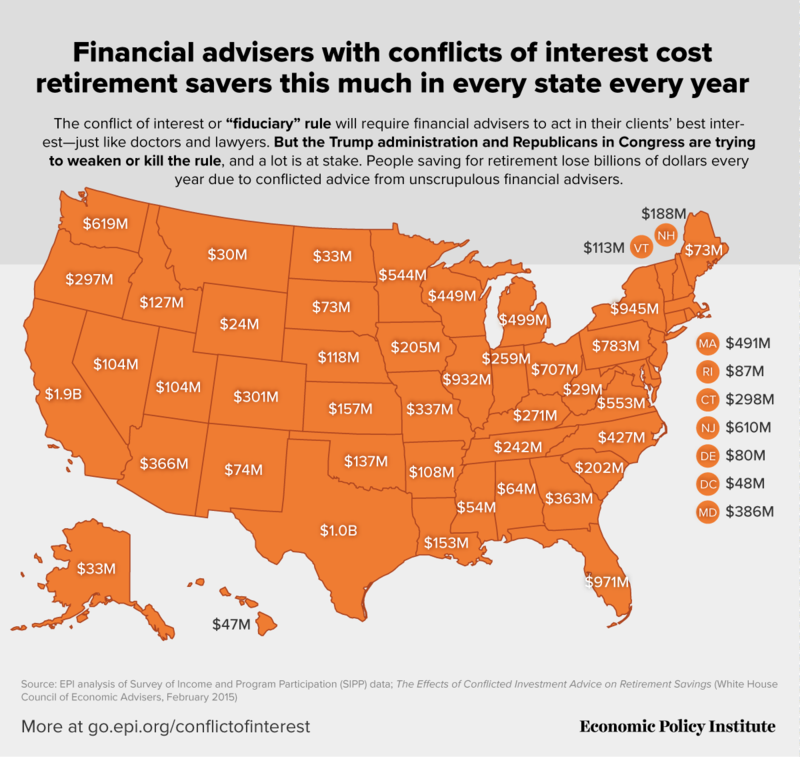 The map above and the table below show how much retirement savers lose annually in each state as a result of receiving conflicted advice. All told, people who live in the states represented by the 40 cosponsors of the CHOICE Act lose $12.1 billion each year due to conflicted advice. That their constituents stand to lose so much if the act passes does not seem to matter to the representatives who sponsored it.